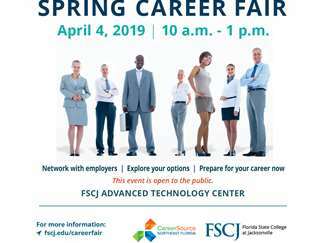 FSCJ Spring Career Fair gives students, alumni and the public a chance to network with employers and explore career options. Job-seekers should bring extra copies of their resumes with them and wear professional attire. For more information, visit fscj.edu/careerfair or contact careerdevelopment@fscj.edu.